Discover something new this summer with Thomas Nelson's summer camps, designed for middle and high-school level students. Our camps will allow you to discover the entrepreneur within you; there's no limit to what you can discover this summer at Thomas Nelson. Hampton – Minecraft Modders: July 8-12, 1 – 4 p.m.
Hampton – ROBLOX Coders & Entrepreneurs: July 15 – 19, 9 a.m. – 12 p.m.
Hampton – Code Breakers: July 29 – Aug. 2, 9 a.m. – 12 p.m.
Hampton - Make Your First Video Game! - July 22 – 26, 9 a.m. – 12 p.m.
Hampton - Make Your First Video Game! - July 22 – 26, 1 - 4 p.m.
Hampton – Minecraft Modders: July 8-12, 9 a.m. – 12 p.m.
Hampton – ROBLOX Coders & Entrepreneurs: July 15 – 19, 1 – 4 p.m.
Hampton – Code Breakers: July 29 – Aug. 2, 1 – 4 p.m.
Monday, July 22 - Thursday, July 25, 8 a.m. - 12 p.m. 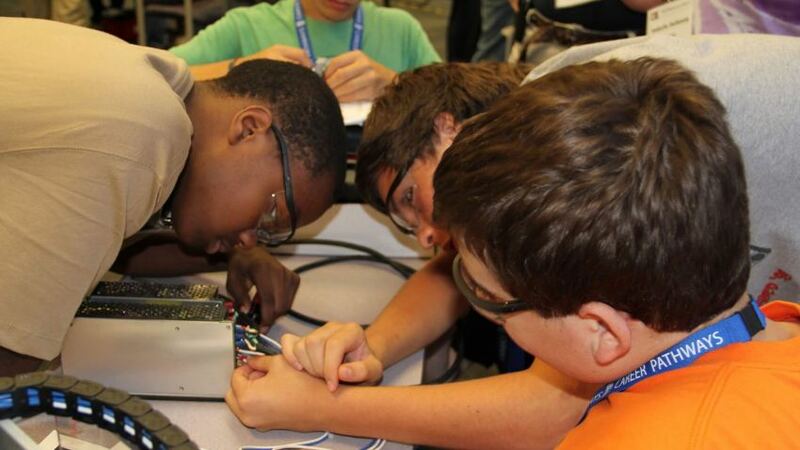 Rising middle school students can unlock their curiosity as they explore issues related to space during the Thomas Nelson Summer STEM Camp. This exciting curriculum gives students hands-on science experiments and activities conducted in our science and computer labs. Investigation of space related topics relating to biology, chemistry, drones, computers and physics will be included in the four-day camp. Do not miss this exciting educational opportunity to unlock the scientist in you! Monday, Aug. 5 - Friday, Aug. 9 • 8 a.m. - 1 p.m. OR 12 - 4 p.m. Learn to code your own robot! During this class your team will learn to program a robot. You will see firsthand how your program translates into action as you attempt to control your robot and maneuver around obstacles. The camp is open to rising 3rd through 8th graders. The camp is free to residents of the Grove community in James City County through the generous support of Dominion Energy, Kiwanis Club of Colonial Capital, the Rotary Club of the Virginia Peninsula, and the Virginia Space Grant Consortium.